Gum won’t really sit in your stomach for years, but it can preserve human DNA for millennia. Researchers have uncovered genetic material encased within 8000-year-old tarlike wads known as birch bark pitch, which Scandinavian hunter-gatherers chewed to make a glue for weapons and tools. Among other things, the DNA suggests these toolmakers were both male and female, and some may have been as young as 5 years old. In the late 1980s, a team of Swedish archaeologists excavated a pit within an archaeological site called Huseby Klev in western Sweden. Here, they discovered more than 100 coal black, thumbprint-size lumps riddled with distinct toothmarks. Chemical analysis revealed these were pieces of pitch, an early adhesive derived from plant resin. Researchers already knew ancient toolmakers heated pitch distilled from birch trees over a fire to soften it, chewed bits of it into a pliable state, then used the sticky wad to fasten sharpened stones to wooden or bony shafts to make weapons and tools. 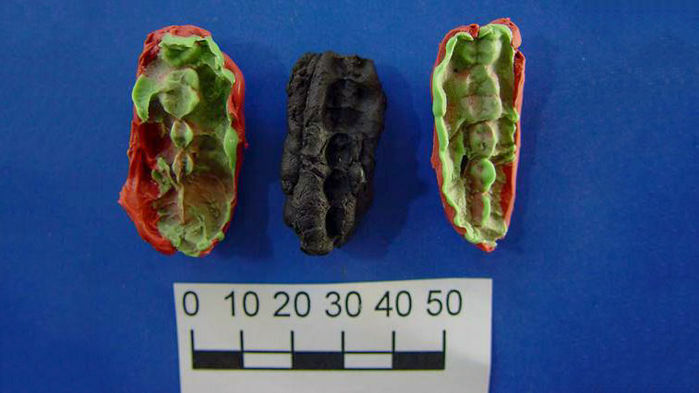 Natalija Kashuba, an archaeology Ph.D. student at Uppsala University in Sweden, and colleagues wondered whether any usable DNA from the chewers’ saliva remained inside the hardened resin. Kashuba, who did the work while a student at the University of Oslo, and the rest of the team took tiny samples from three wads, ground them to powder, and put them through an extremely sensitive DNA amplification process designed to locate ancient DNA, which is often highly degraded. The researchers identified human DNA in all three pieces. Further analysis revealed each came from a different individual—two females and a male. Based on estimations of tooth size and wear taken from the toothmarks in the pitch, the researchers suspect the chewers were young, between 5 and 18 years old. Adult tooth impressions have also been found in pitch from the site, which could suggest an egalitarian toolmaking process involving all sexes and ages, the team reports this week on the bioRxiv preprint server.